I’m sure anyone who has sat in an iconic Adirondack Chair would agree that a perfect model must be solidly built and comfortable. That was our top criteria for selecting the best Adirondack Chair. If you want to cut to the chase, the Highwood Foldable Adirondack Chair beat out our former number-one pick, the Polywood Adirondack Chair because of its sleek design and long-lasting durability. These two aspects helped to make it our new, number-one choice. 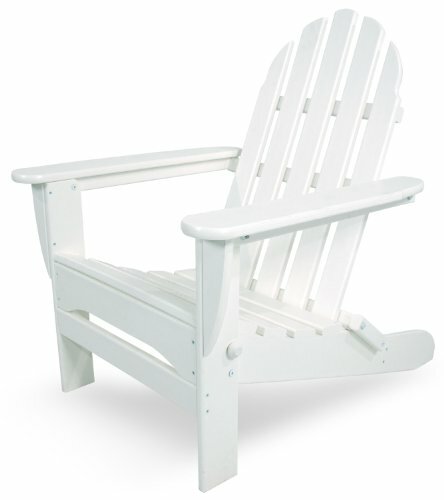 Classic, cool, and comfortable, the Adirondack chair is a wonderful representation of Americana. But most importantly, Adirondack chairs are an inviting piece of furniture you can add to your patio or landscape to create a relaxing space. Adirondack chairs symbolize comfort, good times, and hospitality. Placing them in your yard will encourage your guests to relax, enjoy pleasant conversation, and the beautiful outdoors. There are hundreds of options when it comes to finding the right Adirondack chairs. Having so many choices can seem overwhelming at first. We took it upon ourselves to research and review the top-rated Adirondack chairs so you can get straight to the business of decorating. In this guide, we also included a section that goes into the little “extras” that you might not think about. You’ll soon realize that having a few Adirondack chairs sitting around is a fantastic choice for your home. You can select from any color of the rainbow, as well as a multitude of materials such as teak, cedar, mahogany, or environmentally friendly plastic. Once you’ve chosen your Adirondack chair, you’ll need to learn how to properly care for it in order to get years of quality use. You don’t have to live in the Adirondack Mountains of New York to enjoy the comfort and luxury of these wonderful chairs. We have a new Adirondack chair as our top choice this year, and that is the Highwood Foldable Chair. It comes in 12 color options and in 2 sizes. We personally tested the King model in Weathered Acorn. Highwood chairs are made in the USA and come with a 12-year warranty. The recycled-plastic of these Adirondack chairs remains an even color over time and can be power washed to look like new. We began our testing two years ago and the original recycled plastic endured two sets of four seasons and didn’t fade. The Highwood has a slightly curved back which makes it the most comfortable chair we tested. 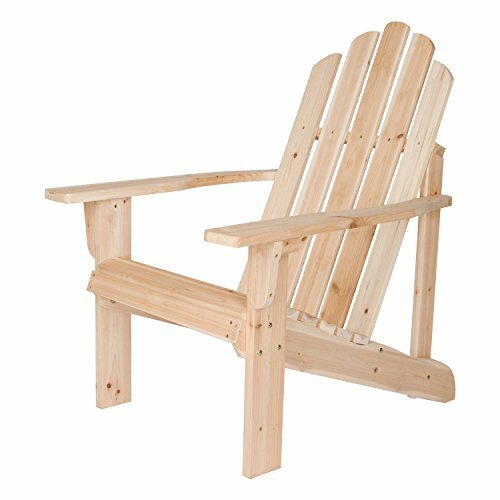 This folding Adirondack chair from POLYWOOD will definitely make you feel that summer has finally come. With its classic design and comfortable, contoured seat, you’re going to enjoy spending quality time outdoors. The sturdy construction is made of solid, recycled lumber, and it’s durable enough to withstand the elements. It is made using a handy, folding design for easy storage and transport. You can choose from a variety of fun and attractive colors that give the perfect illusion of painted wood without having to deal with the hassle of maintaining actual wood. There will never be any painting, staining, and waterproofing required and you will also never need to worry about peeling, rotting, chipping, cracking, or splintering. Just when you thought this chair couldn’t get any better, you’ll be excited to learn that it’s also resistant to stains, corrosive substances, fungi, insects, and plenty of other environmental stresses. This worry-free chair also happens to be proudly made in the USA, and it’s backed by an astounding 20 year warranty. With all these features and benefits, there’s no need for you to buy a traditional wooden Adirondack chair. This model from POLYWOOD will literally take care of itself throughout the years. Adding this chair to your patio is the perfect way to create an inviting environment for your family and guests. Affordable, easy-to-maintain, and comfortable, these Adirondack chairs are a sound investment for the comfort of your home. Adirondack chairs are iconic and one of the most comfortable ways to enjoy lounging on the patio, in the yard, or by the pool. When you order an Adirondack chair from Lifetime, you’re going to need to plan to set aside some time to assemble it, but the process is actually quite easy. The seat comes fully assembled, and the back comes almost totally assembled. You’ll receive an Allen key in the box and you can use it to install the few lastscrews that need to be installed. Also, the manual is quite handy with its easy-to-read instructions. 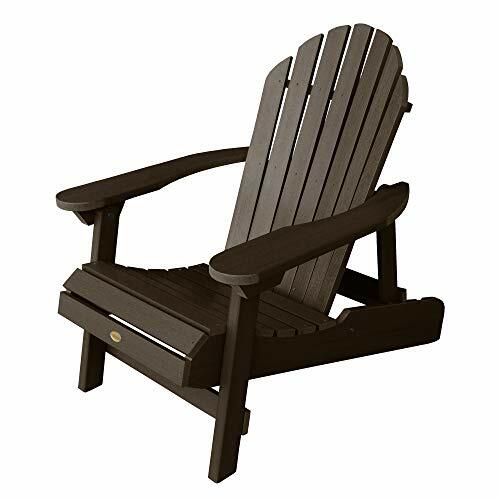 With its fine, natural finish and quality construction, this Adirondack chair is classic in style and very comfortable. These chairs are expertly manufactured and include pre-drilled holes and quality stainless-steel hardware. One tip with these chairs: be sure to not over-tighten the screws during assembly as this could lead to cracking the delicate boards. Another great thing about these chairs from Lifetime is that they’re affordable. This means you can purchase multiples to have adequate seating on your patio or lawn. There’s nothing more relaxing on a fine day than lounging with friends on Adirondack chairs. These chairs also add style and sophistication to your home. The finish is neutral which makes them suitable for any home design or decor. Whether you’re purchasing Adirondack chairs for the first time, or you’re looking to replace some that have become weathered and tired, this chair is a fantastic choice. Built to stand the test of time and work well in the elements, the Lifetime Adirondack chair is a sound investment for your home and your life. The Shine Company built these Marina Adirondack chairs to stand the test of time. Built of high-quality, yellow cedar wood that is known for its natural ability to resist moisture, decay, and insect damage, these chairs also feature a polyurethane paint that gives added protection against weather, sunlight, and heat. Rust-resistant hardware is another element that makes these chairs so durable against problematic weather conditions. It will take you approximately 20 minutes to assemble each chair. Once it’s ready you’ll be able to enjoy a relaxing moment testing it out. This chair is a top-rated Adirondack chair for good reason. It is constructed of genuine wood which gives it that classic look and feel, but it is still low maintenance and can withstand the elements. Comfortable and practical, this chair comes in an elegant unfinished color that can fit any home decor. You will see why this is a top-rated chair right out of the box. The assembly is quite easy and it features certain design elements that make it stand out from the others. Whether you’re new to owning Adirondack chairs, or you’re replacing your old ones, this is a perfect choice. Once you experience them, you’ll realize that no barbecue, outdoor party, or pool day is complete without being able to lounge away in one of these comfortable chairs. The above Adirondack chairs are all top rated because they share the same comfortable features, are easy to assemble, and can easily withstand the elements. You are guaranteed when you purchase one of these that you’re getting the most for your money and that the chair will stand the test of time. 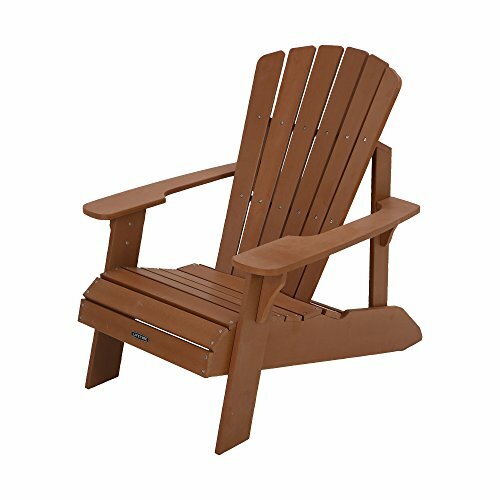 Each of these comes in the classic Adirondack style and gives you all the luxury and comfort of a traditional Adirondack chair without the large price tag. However, if your heart is set on a traditional wooden model, or a different style, then the below Buyer’s Guide will help you to learn about these remarkable chairs. What’s great about Adirondack chairs is that there are so many options. You can literally pick from dozens of colors or even choose a set using multiple colors for a fun and funky look that adds whimsy to your environment. You can also choose a more traditional look using cedar Adirondack chairs that will give your environment a mountain-like feel. It’s also possible to purchase an unfinished Adirondack chair and paint it any color you like. With so many options it can seem a bit daunting but is doesn’t need to be. In this Buyer’s Guide we’ll explore all the options that are available to you. When furniture becomes iconic you know there’s something truly special about it. The Adirondack chair is a symbol of a relaxing and peaceful lifestyle – one that we all crave. The wide, wood slats along its arched back, the deep sloping seat that is comfortable to sit in, and the flat arms that are so inviting and can easily hold a cool drink; all these elements beg you to loll away the afternoon on a fine summer’s day. You don’t need to be a Carnegie, a Vanderbilt, or any other wealthy family member to enjoy these chairs. You need not be living a century ago, attending the great camps in New York’s Adirondack Mountains. Today these chairs are available for everyone, no matter what your budget. This Buyer’s Guide will help you find the most durable, comfortable, and indulgent chair you can, and at a price that is right for you. There are so many to choose from. And, they are made from various materials and coming in a rainbow of colors. No matter which you choose, you’re going to find that the sizes and shapes of these iconic chairs are quite similar. Be fun and adventurous. Or pick chairs that match the decor of your home or lawn. You’re going to see that once you have Adirondack chairs outside, the atmosphere of your backyard will instantly be relaxing and fun. This book sparked a desire in people to experience the great outdoors, and once they arrived in the Adirondacks, there were the Adirondack chairs on which they could sit and take it all in. This passion for outdoor life is still at the heart of Adirondack chairs’ personality and appeal. Though they are no longer made from traditional crates, salvaged wood, and leftovers from sawmills that they once were, today’s Adirondack chairs still maintain their rustic simplicity. The keep this feel even though they are constructed of more elegant materials such as oak, mahogany, teak, and white fir, as well as durable non-wood materials such as resin. Wood: Wooden Adirondack chairs are the most traditional and they can be stained or even left unfinished and weathered to a natural gray color. The most traditional colors are white and dark green, but you can get painted chairs in many cheerful hues such as blue, pink, yellow, and even orange. When you are selecting a wooden chair, be sure to consider the color as well as the texture. Teak: With a teak chair you’re going to get enhanced durability and weather resistance. This is great if you’re looking for a more maintenance-free chair. Cedar: This is another ideal Adirondack chair material because of its natural resistance to moisture, rot, and cracking. There’s also a rich aroma that comes from cedar that is pleasant and also functions as a natural insect repellant. Cypress: These chairs have fine, tight grains that are resistant to warping. There are also natural oils in cypress, similar to cedarwood, that helps to keep the wood from rotting. It is also good at repeling insects. One of the most popular finishes for cypress is an acrylic stain in a white shade. Pine: This is perhaps one of the most beautiful woods when it is stained. You’ll find that there are naturally occurring knots in the pine that give it a wonderful rustic look that is condusive to the look and design of an Adirondack chair. Pine is also resistant to insects, weathering, and rotting. Mahogany: This is a beautiful, rich wood that features dense grains. It is a tropical hardwood that is similar in strength to oak or teak. It is also a more scratch-resistant wood, but you’ll need to refinish it annually to keep it that way. Tropical Mahogany is another wood that is resistant to decay. Shorea: This is a wonderful choice of material if you like aged wood in shades of silver. You’ll find that straight-grained Shorea will naturally age from light brown to a beautiful soft gray if left unfinished. This material is also repellent to insects and stands up well in strong weather conditions. Oak: Armed with a naturally occurring preservative, oak is a fantastic choice for an Adirondack chair. Light oak is particularly popular because of its pleasing, soft-brown coloring. All-Weather Plastic: This material is what makes up our top rated chairs because it’s the most affordable and is resistant to the elements. These environmentally friendly Adirondack chairs help to prevent deforestation by using recycled plastics that are a great choice for eco-conscious shoppers. Being entirely maintenance-free is another aspect that makes these chairs desirable. Although the design of an Adirondack chair is basically unwavering, there are still a few variations you can find which add to comfort and support. However, despite any changes, all Adirondack chairs will still feature the iconic silhouette that you have come to expect. Some variations include curved “comfort” backs and oversized seats. If you’re looking for easy portability, you’ll find a number of folding Adirondack chairs that are quite convenient. For those who love to sunbathe, there are reclining chairs as well as Adirondack chairs which feature a slide-out ottoman to put your feet up. Did you know that there are even Adirondack rocking chairs? These are made from yellow birch, a wood that offers you strength and a leather-like texture. Wood is the most popular material for Adirondack rockers, but it’s also possible to find them in Mahogany, teak, cedar, and cypress. Yellow birch rockers have been around since the early 20th century and they’re still a fantastic choice today due to their comfort, durability, and tranquility. Some other unique designs that you might enjoy include Adirondack porch swings, gliders, benches, and coordinating side tables. There are also perfectly-sized chairs for children. You’re going to see that when it comes to comfort and style, you can either go traditional, or you can get one of the many Adirondack variations that add even more comfort and coziness to your life. Adirondack chairs are incredibly useful and comfortable, but today there are a number of additions you can purchase to make your Adirondack experience even more enjoyable. Take a look at these extra pieces and features that you can purchase to enhance your experience. Adirondack chairs are all about sociability, the generate casual conversation on your cottage porch, at a BBQ, or by the pool or river. When you purchase an Adirondack set, you’re encouraging everyone to join the party. Pick a set that has a matching side table, or choose a full Adirondack dining set for more formal occasions. Adirondack chairs are naturally built for comfort. However, they become even more comfortable when you add cushions and toss pillows. These additional pillows and cushions can be quite simple, inexpensive, and fashionable, and they come in a number of colors and styles to choose from. Caring for your Adirondack chair is of the utmost importance, especially if it is made of wood. Should you purchase one of our top rated chairs made of plastic, there will still be some maintenance required. However, it will be minimal compared to real wood. Should you have a wooden Adirondack chair, then be sure to carefully follow this guide to keep it in great shape. Which woods are good for outdoor use? : Every model of Adirondack chair is suited for outdoor use. Western red cedar is particularly suited for the outdoors, as its fine grain is naturally weather-resistant. Chairs made of this wood will last you a lifetime. Many wooden chairs are painted with a high-gloss, water-based enamel and are incredibly stable outside. In fact, nearly every species of wood, and certainly plastic, are suitable to stay outdoors when properly maintained. How often should you refinish a wooden chair? : There is no simple answer to this question because there are many factors to consider when it comes to caring for an Adirondack chair. One important factor is the weather where you live. For instance: is it sunny and hot, or cool and wet? Are you able to store your Adirondack chairs during the winter? Or, in the off-season, are you able to keep your Adirondack chairs covered? These factors will play into how much maintenance work will be needed. Some people love the look of a more weathered chair while others like to maintain the new, fresh look of their chairs. Exposure to the sun and elements will change the surface color of the wood. What it comes down to is personal preference. If you don’t like the weathered look, then purchasing a plastic Adirondack chair might be the right choice for you. Keep in mind that the weathered look of a wooden chair will not affect its structural integrity. Keep in mind that it’s important to at least clean the chairs once a year. What kind of weather finish should you use? : There are many good products on the market for finishing your wooden Adirondack chairs, but there are some particular features that you should look out for in a good finish. You can choose anything from exterior paint to spar varnish, or even tung oil. It’s even possible to paint your chair if you so desire. But be sure to use a good primer on bare wood or before applying the finish coat to a painted chair. Paint will always offer the best form of protection, but it will eventually peel and will need to be refreshed over time. You can expect an outdoor finish on wood to last 1-3 years before it needs to be renewed. Oil or Water-based paint? : Oil based products will last longer on Adirondack chairs but these are harder to clean up and more toxic to the environment. Water based products will be easier to clean up. For an environmentally friendly oil-based paint, consider using tung oil or linseed oil, as both are derived from natural seeds. Advice for a wet climate: In this situation, you want to look for a product that has a mold inhibitor. Be sure to consider a spar varnish which is formulated with the boating industry in mind and can withstand strong marine conditions. Advice for a sunny climate: In this situation you want to find a wood finish that has UV protection. You should apply this on an annual basis. Be sure to follow the manufacturer’s directions for your own health and safety. Should you not want to renew the finish on your chairs, know that they will end up with a silvery-gray color. Once you achieve this gray color, the rate of wood deterioration slows down a lot. This weathering actually prevents further UV penetration. How do you clean an Adirondack chair? : A pressure washer is the most effective tool for cleaning an Adirondack chair. Otherwise, it’s possible to clean it with a soft brush and good wood cleaner. These products can be found at your local hardware store. It’s important to rinse the chair and allow the wood to dry before applying any kind of finish. You’ll find that a mild soap and water bath once every couple of weeks is a good choice and an inexpensive way to keep the chair in peak condition. A simple wash of warm, sudsy water with a cloth is suitable. Then follow this with clear water and rinse the soap off of the chair so you don’t end up with a soapy film. Quickly wipe spills with a cloth because things like carbonated beverages can be hard on clear finishes if they’re left sitting there. Do you need to store Adirondack chairs in the winter? : It is advised that you put wooden Adirondack chairs in storage or in a shed for the winter. If you don’t have a space to store them, then try to at least cover them. Be sure that the chair is dry before you cover it because you don’t want to seal in moisture. Plastic tarps can sometimes promote mold growth and might leak, so always check the condition of the chairs mid-season while they’re stored. How to maintain plastic chairs: You will never need to stain or waterproof plastic Adirondack chairs, even if they appear as though they’re made of wood. You can easily clean a plastic Adirondack chair with soapy water, but be sure to avoid harsh solvents or abrasives. After soap, quickly rinse and dry it with a towel. You can keep all-weather plastic chairs outside all year round with no deterioration or wear of any kind. Adirondack chairs are classic, comfortable, and stylish, and have a rich history that is typically American. Adding Adirondack chairs to your patio or landscape is a fine choice and you’ll see that there are many styles to choose from, in every color in the rainbow. If you’re interested in adding Adirondack chairs to your home, then the above Buyer’s Guide and top-rated summary will help guide you to your perfect chairs. Should one of these models not be right for you, then continue your search until you find the right model for your lifestyle. One of the main factors you’ll want to consider first is what material you’d like the chair to be made of. You can go traditional with wooden Adirondack chairs, or you can select a plastic chair for easier maintenance and upkeep. No matter what style or size you choose, you’re going to love having this iconic piece of furniture on your property. They’re very comforting, and your guests and family will enjoy sitting in them on a fine summer’s day. Should you want to keep them outdoors year round, all materials are suitable, but plastic will certainly require the least care. Plastic Adirondack chairs are also more affordable for most people yet provide the same comfort and elegance of wooden models. Ask yourself key questions, such as how you plan to use your chair, where it will be placed, and how you’d like it to fit into your decor, then you’ll be ready to select the perfect chair for you.